Canadian household debt levels continue to be a hot button topic for policy-makers and media commentators alike. While concern is warranted, the situation is not nearly as dire as some might lead you to believe. Canada’s household debt to disposable income ratio recently hit a record high of 165.92. This means that, for every after-tax dollar Canadian households earn in a year, they owe about $1.66. If you would like more than just the Coles Notes, the remainder of this post explains further. If not, there's always the cat video. While the level of debt is high, the growth rate of debt isn’t. In fact, after adjusting for inflation and population growth, debt has only been growing at around 2% per year for the last 5 years (see chart below). Furthermore, much of the growth in debt occurred during the mid 2000s, which was tempered by a series of tightened lending restrictions that began in 2008. 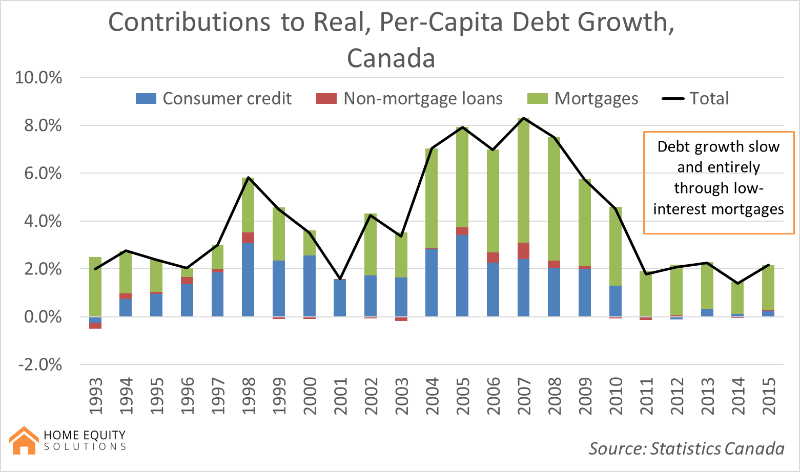 The chart below shows real, annual, per-capita debt growth for Canadian households, broken out by type of debt. The black line is total debt growth, which is the sum of the components. The reason we still have a rising debt to income ratio stems more from slow income growth, rather than rapid debt growth. Over the past 5 years income only rose by 1% a year, while debt rose by 2% - slowly increasing Canada’s household debt to income ratio. It’s true that we continue to take on more mortgage debt, however, we aren’t paying more for it. Record low interest rates mean that we are actually using less of our income to pay interest on our debt. The chart below shows the percentage of Canadian after-tax income that goes to interest payment on debt. Falling levels mean that less of our income goes towards debt payments. Essentially, while the level of our debt has risen, the burden of it has fallen. While some of our debt has gone towards retail sales, much of it has been used to acquire assets, such as homes. The value of these assets has risen by more than our debt, leaving us wealthier as a nation. The graph below shows the ratio of household assets to household debts. 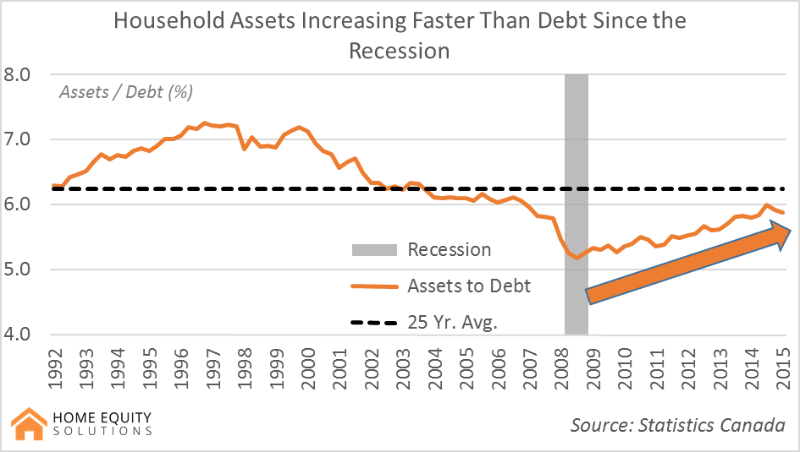 A rising value indicates that assets are rising faster than debts. For a more detailed analysis on this subject, look to work from the Fraser Institute. What we have done with this money is crucial. 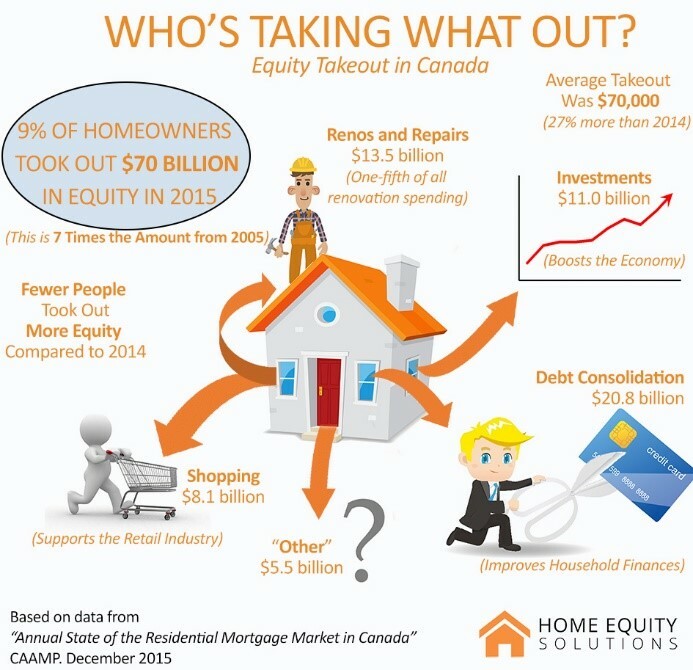 The majority of equity take-out has been for the purpose of debt consolidation, with renovation and investments also accounting for significant proportions. 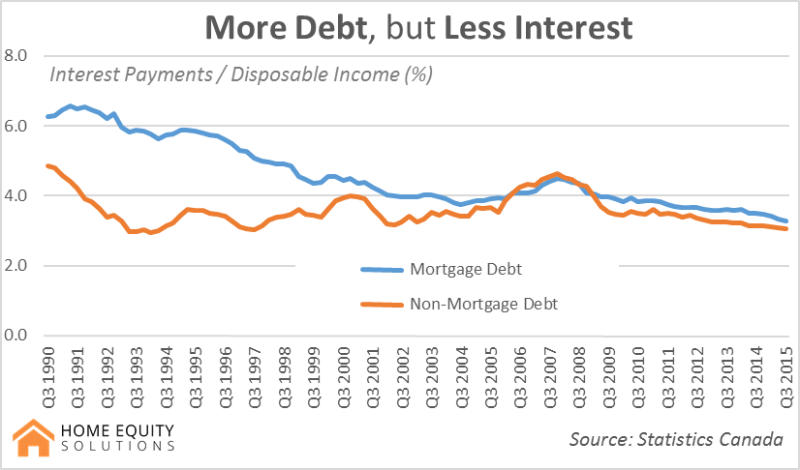 While there is valid reason to question to the accumulation of non-mortgage debt in the first place, the consolidation of it into low-interest mortgage debt undoubtedly makes household finances more sustainable and less risky. What is important to emphasize here is that these are concerns revolving around Canadian households’ ability to weather negative exogenous shocks, rather than debt levels themselves causing a crisis. High debt levels are more of a vulnerability than a trigger.